Morgan Advanced Materials Composites and Defence Systems combines core competencies in materials technology, manufacturing and systems integration to design and deliver products of outstanding performance. Morgan solve complex engineering problems for specialist applications in defence and commercial markets including medical, transport, aerospace and energy. The Silverback 4020 Elite bomb disposal suit is Morgan Advanced Materials’ highest protection, elite performance bomb disposal suit, delivering high protection with unrivalled mobility. Through utilising advanced materials and world class garment engineering, it provides maximum protection and survivability against the four aspects of blast: pressure, fragments, deceleration and falling objects, protecting the operator even if the device is located in a challenging or restrictive location. The flexible design of the Silverback 4020 allows for the performing of manoeuvres including climbing, crawling and crouching. Integrated cooling and ventilation allows for extended wear and reduces strain and fatigue on the operator. Optional capability including cameras and communication systems can be used with this suit. 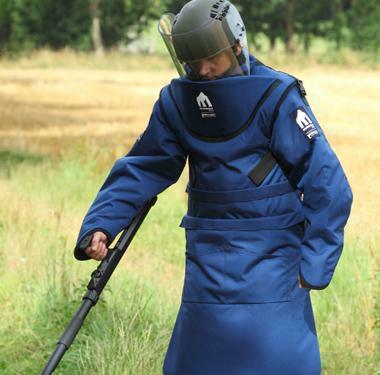 The Silverback 2010 de-mining apron and leg protection provides high level safety for de-mining operations. Designed for extended wear and comfort, the backless design allows for unrestricted air-flow. The apron protects the user’s upper body and knees; it is adjustable in two positions to enhance comfort. The Silverback 2010 helmet and visor provides protection to the user’s face. Additional enhanced protection is achieved through optional long sleeves and leg protection. The Silverback 2010 comes with an apron, helmet and visor and short-arms as standard. For enhanced protection, long arms and leg protection is available.